“Kwan Yin—also known as Quan Yin, Guan-Shih-Yin, Kwannon, Quan Am, Kwan Seum Bosal, she of many names—is the pre-eminent goddess in all of Asia… The bodhisattva is a person who pursues her path to awakening or enlightenment but stops before final liberation, vowing, “I will not achieve full liberation until every being in the universe is enlightened”…She is often seen as the supple maiden-goddess, her robe blown by the sea wind, or as the deep meditator who sits looking inward in perfect peace. She carries a vial holding the fluid of compassion, which she pours out over the world…In her left hand she carries a long-stemmed lotus blossom, symbol of the truth that purity is rooted in the muck and the mire of experience, as the lotus stem rises from the mud at the bottom of the pond up through the murky water, it’s petals opening on the surface into the flower of perfect awareness.” She Appears: Encounters with Kwan Yin, Goddess of Compassion by Sandy Boucher, pp.2-3. Getting introduced and getting to know a new Goddess always feels like a big deal to me. It’s easy to see everything, nature, birth and life as grace filled. It’s a little more daunting to get to know a Goddess, her names, her ways, her gifts and her nuances, and like learning about a friend and becoming best friends. That’s how it’s been for me with Kwan Yin. Slowly, over time, over chants, reading, learning, and sitting with Her, oh my Goddess, what a gift she has been to me. 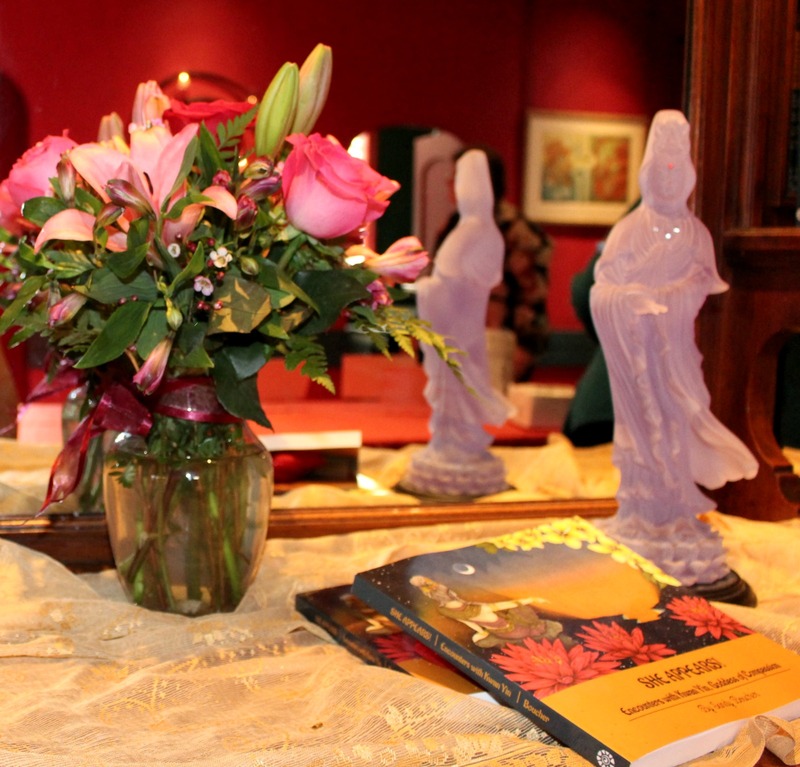 I don’t really remember when I first was introduced to Kwan Yin as a Goddess; but my first introduction to her power, her message and her compassion was when I read Sandy Boucher’s book, She Appears: Encounters with Kwan Yin. It’s a magical book, full of powerful stories and beautiful art work that inspires and nourishes the soul. It also introduced me to an amazing Goddess, one who is full of compassion and grace, willing to be Source and sourced as comfort, hope and caring, especially during times we find it hard to care for ourselves. Deva Premal’s Om Mani Padme Hum chant is lovely! Goddess Ink hosts a lovely Pinterest link with images of the beautiful Kwan Yin! 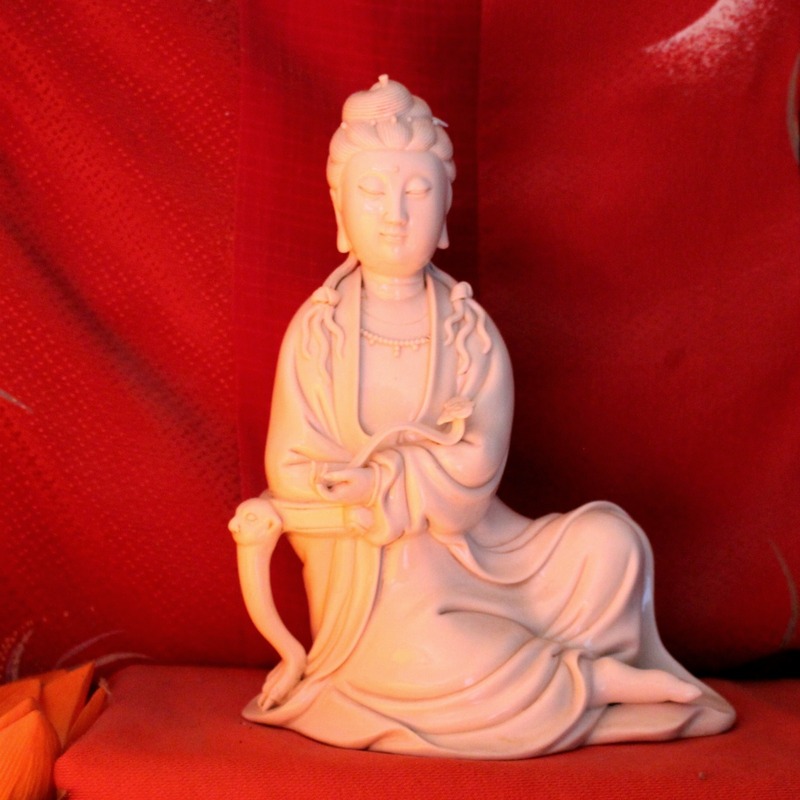 May you find the compassion you need in the wonderful connection with the beautiful Goddess of Compassion: Kwan Yin. THANK YOU for sharing that link and information!